"there are thousands of spots in this country where, with the requisite knowledge, a man could live solely on the bounty of nature...with the judicious, if incongruous, use of a home freezer, he could stay fat the year round by reaping where he did not sow"
euell gibbons wrote this in 1962 as an introduction to his famed stalking the wild asparagus. if you don't have it in your possession, but do have any interest in foraging your own food, you ought to find it. this book, along with peterson field guide to eastern/central medicinal plants and herbs have been my constant companions this spring as we enter our second month in vermont. naively i thought foraging would be the last of my concerns on a farm. i imagined my freezer, larder, pantry, root cellar stuffed with goods i had grown. i envisioned a garden brimming with green. isn't that the whole point of farming and gardening? to cultivate both meat and vegetable and do away with foraging and hunting. what i managed to so boldly overlook was the Early Spring. here we are, four weeks into our journey in vermont, and the garden is still mostly bare. we had a light snow cover on saturday. and three frosts in the past seven nights. the cold frame has sprouts. there are trays of starts all over the house wherever there is light or warmth. our stores of last year's soups and preserves are running low. our potato and onion supply have vanished (save for a basket of both that my dear lindsay brought us this sunday). we are certainly not starving. the chickens and cow have made sure of that. but the litany of eggs and milk and milk and eggs every meal for every day can be a bit much to handle. "since you won't get that gardening going until the snow stops threatening, i wanted to let you know i spied some ramps (edible wild garlic) on your driveway. some vitamin c for you! eat the leaves and the bulbs. it was a drive by ID, but i doubt it can be anything other than that. it's growing on the slope up and down the driveway hillside on your right as you approach that kinda ramshackle run down trailer situation at the first s bend." i don't know how we would have eaten so well, if it wasn't for her kind note. we went to investigate and sure enough, there were thousands of ramps growing admist the trees just below our milking barn. they are known as ramps in these woods. wild leek or wild garlic to others. but they grow in often abundant populations in rich, wet woods. since then we have been using the greens and bulbs in salads, in scrambled eggs, in dressings, in potatoes, in soups, and, my favorite, in pesto. 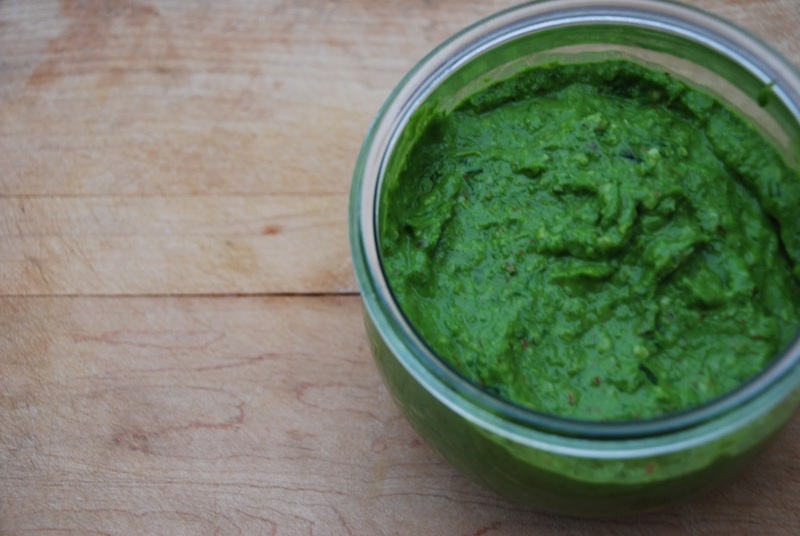 it can serve as the substitute for both the basil and the garlic in your pesto. some like to add parsley to this to temper the power of the ramp (as it is almighty). we don't have any parsley yet, so i added the ramps bits at a time, tasting as i went. when harvesting the ramp, i recommend a spade to gently dig the bulbs up. like cultivated leeks and onions, ramps are slippery and it is easy to pull just the leaves off while the bulb remains firmly entrenched in her ground. 1/3 c crushed almonds, pinenuts, walnuts, whatever. the beauty of pesto is twofold; you can use any nut or cheese or green you have available AND there is no real science (in my decidedly unscienced brain) to how much of anything you put in. use the above as a jumping off point but then add more of whatever according to your taste. i have never relied on foraged goods for my survival. and it would be brazen to say that is what we are doing now. but i have a belatedly-found respect for what grows in the woods now. and i must say, i look forward to fostering this new dependence i have with the forest and meadows around us. have any of you been little mountain foragers this spring? any recommendations for what to find or how to cook it? as a somewhat obvious caveat: when foraging always consult at least 2 books on the foraged item before eating. photos in plant guides will always differ with what stage in the plant's life they were taken. it is forever a good idea to have a Second Opinion, or even a Third. and a less obvious caveat but no-less important: don't over-harvest an area when foraging. you want to leave enough for the plant to re-seed itself so that you and the other forest nymphs can enjoy an eternal supply. Yum, Kate. If you've got any extra lying around I've heard good things about pickled ramps. When Craig and I worked at the outermost on mv the chef would always do a crazy forage for them early in the season, I'm talking trash bags full of them, and then pickle them to have through the spring and early summer. I was busy searching our woods last night for the first signs of Wild Garlic, no luck up to now. I've copied your lovely photo to help with my identification, hope you don't mind. we love to eat ramps this time of year! I've never made pesto with them though! so excited to try this recipe! be careful to not over harvest as that is a growing concern and.. Ramps fetch top dollar with chefs in any major city. Harvest them so as to thin them out and give them space to expand and they will provide year after year of early income. Go looking for more too... where there is one patch of ramps there are always more. take a look at what the environment is that they're growing in (slope, soil type, trees) and then keep that in mind when you are walking through the woods this time of year. and while your out there look for fiddle heads (usually just before ramps are ready) and morels (usually just after ramps are finished) to keep the income streaming in before the garden gets going. as far as eating... the old timers always refered to this time of year as "starvation season". maybe don't advertise where you're finding them either... you never know who's listening. i just fell in love with ramps this spring. i like the pesto idea and will give it a try. ramp ramp pizza is what i made at the deli i run. i thinly sliced all of the ramp below the green and sauteed in a bit of butter and removed them from the pan. then i roughly chopped the greens and briefly sauteed as well. top the crust of your choice with the sauteed greens. follow with cheese (i liked just a simple mozzarella best) and top with the bulb part of the ramp saute...a little salt & pepper then bake until browned and delicious. my coworkers, husband and i ate almost nothing else for days! Oh my goodness! I am so wanting to try these now! I must look to see if they are in ID when I go home for a visit! And I must check out these books! This was a great post, thank you. Later on the same day I read it, I saw this beautifully photographed little project and thought you might appreciate its potential as a short-term greenness source: http://casayellow.com/garlicky-pea-shoot-scrambled-eggs/#more-1578. When hiking on the AT we foraged morels and ramps---delicious! We have some various wild garlic/onions around here but I haven't tried harvesting them. Some day! Vive la saison de l'ail des ours!!! You can also do aromated (???) vinegar with the flowers, do you that? hello good farm woman. i love your blog and the way you share your journey with us. i offer this slight criticism as a cyber-friend (and I hope you do come visit us at the butcher shop one day) ok...when in comes to foraging for wild foods, we must think about the sustainability of our practice, and it has come to light that the awesomeness of ramps is of course a big draw and so there is concern about the harvest method. jeremy and i have with a slight internal frown taken to the practice of leaving the roots, for obvious reasons. the lack of bulb is a little sad but there is much to still love and a bit to pickle! especially as you are so inspiring to your readers, I know they will tune into this issue with your explainations! pickled ramps are certainly up for this week julie! and to those concerned, i certainly advocate to NEVER over harvest a wild edible. you can certainly leave the blubs and just take the greens, and then harvest the blubs later on in the summer as they will continue to grow OR you can take the whole plant and be sure to leave plenty around it so that they will reseed themselves! hope you all like the pesto.